This started life as one of my Grandfathers Pictures from Rome, Italy in 1926. 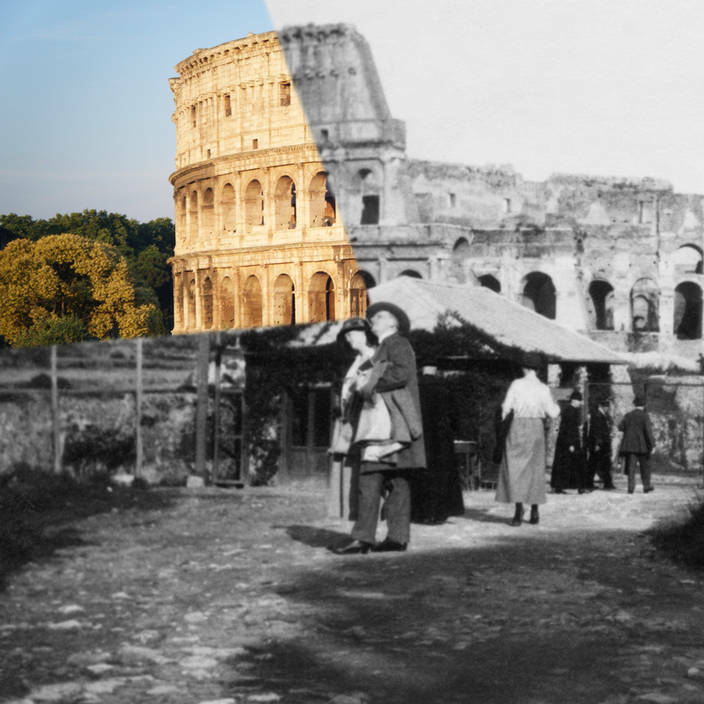 The Colosseum is so well photographed it did not take long to find a modern image shot from the same angle. Google maps has geotagged images which makes it easy. Once I had them both lined up in Photoshop I created a mask to reveal the modern image. Fantastic composition. I wonder if you could mask out individuals from the old photo into the new? Have you got the link to the originals? This image evolved over a few days. When I was writing the post I went back to Google maps so I could find out who to credit for the modern part. Despite hours of searching I just could not find the same image again. You could mask out individuals. In this image the man would be standing in a bush. So I decided to make it, his view, as even in 1926 he would see the world colour. The building matches very well but it is difficult to visualize what obscures the bottom left of the Colosseum. You can see (I think) a car coming from the left. I remember (1964) hurtling down that road towards a big roundabout where it seemed no-one slowed down as they entered it but everyone seemed to make it out the other side. nice shoot and compo. very curious.